From time to time I am asked why I link to the Daily Mail in my Explorator newsletter. As most folks are aware, the Daily Mail is a flashy, pop-culture-gossip-oriented British newspaper which generally is looked askance upon by folks who are fans of serious journalism. Indeed, when it comes to news about archaeology and/or the ancient Greek and Roman worlds, almost without exception something found in the Daily Mail will be a rewrite culled from other sources, but lavishly illustrated with tons of photos and usually a sidebar or two with useful background information. It is a guilty pleasure of sorts to regularly read it (for which I blame Dorothy King for removing the ‘stigma’ (if that’s right word)), but I do link to it precisely for the photos and sidebars. For the most part, the rewrites add nothing of value other than a bit of hype and a headline which may or may not fit comfortably into a tweet — which results in numerous rewrites of the headline over the course of the week. Whatever the case, the point of this long-winded introduction is to emphasize that when it comes to ‘breaking’ a news story about the ancient world, the Daily Mail generally isn’t the one to do it and their coverage of anything of the sort usually only pops in my mailbox after the story has appeared elsewhere. According to the Daily Mail, the pensioner was told the item dated to about 300 BCE and was valued at £100 000. ‘It is notoriously difficult to date gold wreaths of this type. Stylistically it belongs to a rarefied group of wreaths dateable to the Hellenistic period and the form may indicate that it was made in Northern Greece. ‘It is eight inches across and weighs about 100 grams. It’s pure gold and handmade, it would have been hammered out by a goldsmith. the wreath is said to be similar to one auctioned in 2012 for almost £200 000 and will be coming to auction June 9. Perhaps there is a policy at the Daily Mail to boost numbers whenever possible by a factor of ten (as seen in the price and the find date)? Whatever the case, the auction house does not seem to be on the same page as the Daily Mail at all. The first thing that made me do a Marge Simpson hmmmm are the two eyelets. They looked awfully modern and it was difficult to find an ancient example of a wreath with similar items. In fact, the only one which seemed ‘reliable’ was a piece at the Boston MFA and the ‘loops’ still look markedly different. All the leaves have a border/outline around the outside edge; I looked in vain for an ancient example of this and most other examples (including the Boston item) seem to be ‘scissor cut’ from a sheet of gold; these seem stamped or even cast. 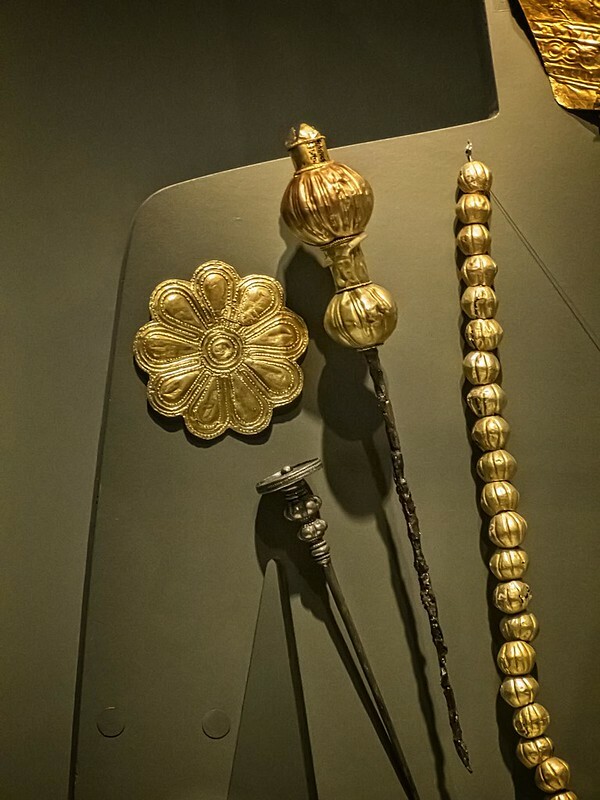 I would be happy if someone can point me to similar style leaves from the Hellenistic (or other) period. The flowers (which we are told are myrtles) have too many petals (six as opposed to five). Similarly, they seem to be stamped out as opposed to cut and soldered — most examples one can find on the web have individual leaves which seem to be attached to the center thing. Previous Post Aristotelian Skepticism: Is It Really His Tomb? Bare in mind I have zero knowledge of Hellenistic wreathes. I do have a bit of knowledge of 19th c. jewelry and art, and this looks like an early 1800’s piece to me. I leave open the possibility that I’m way off, but it was the first thought when I saw the Daily Mail headline & picture. Grecian, not Greek, especially considering the collector’s country of origin. It’s still lovely. I was thinking 19th c and scrolling through websites — that perhaps it was looted in the 40s but from Holocaust victims, not an illegally excavated Greek tomb. And then I found this which has flowers similar to the central “not-daisy” in the rediscovered wreath…and has a clear provenance. That has good comparanda potential, although those items are much larger than the wreath … similar idea. In that same exhibition are gold masks with the same motif on the eyes. There is a consistent ‘eight petals’ though … perhaps inspiration? Could be a costume piece from the 1800’s. Sometimes masquerade ball costumes included some pretty pricey elements.